Since we know we need a switch to be closed in order to conduct electricity and provide a path for current in this circuit, we are looking for the necessary conditions to close each switch. For any normally-closed (NC) switch, this means a stimulus value less than the actuation threshold. For any normally-open (NO) switch, this means a stimulus value great enough to exceed the threshold and “hold” the switch in its actuated state. 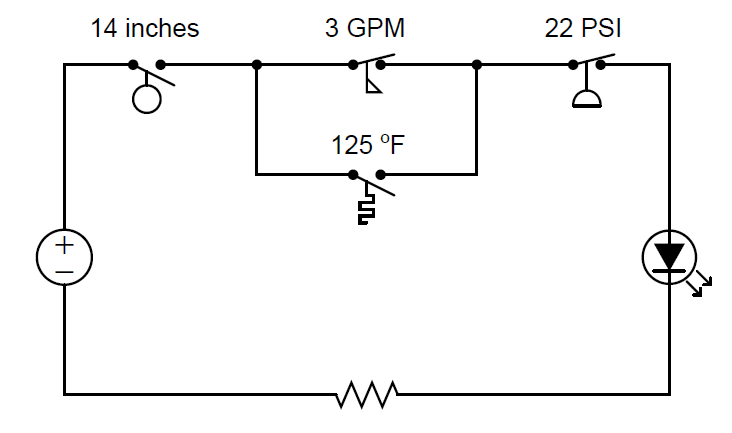 The flow and pressure switches in this circuit are both NC, we are looking for flow and pressure values less than the respective settings. Since the level and temperature switches are both NO, we are looking for level and temperature values in excess of their respective settings. The present status of a switch may be determined by comparing its stimulating quantity against its trip (threshold) setting. A switch will be in its “normal” (resting) state when the stimulus value is less than the threshold value. Conversely, a switch will be in its “actuated” state when the stimulus value exceeds the threshold value. Determination of a switch’s status, therefore, is a matter of comparing the stimulus quantity to the threshold “trip” setting. 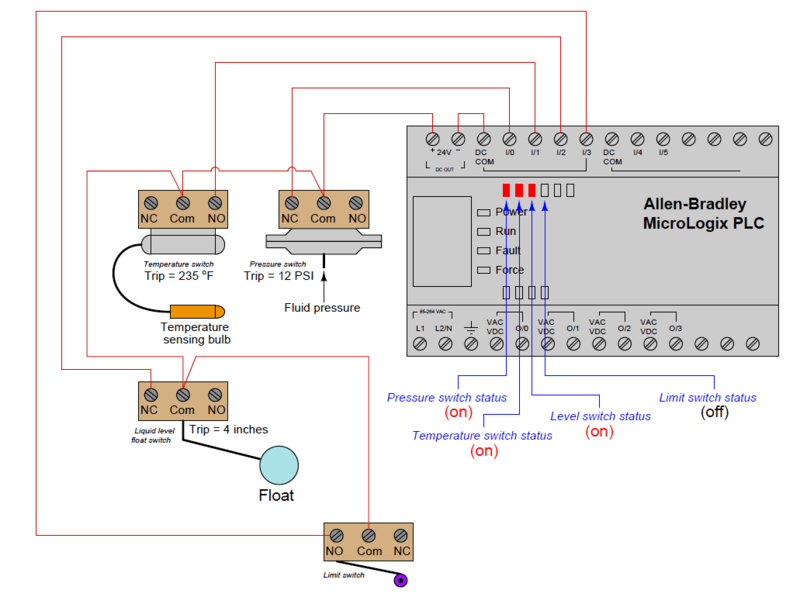 One cannot simply look at the schematic diagram to tell what the switch is doing – one must compare the switch’s setting versus against a known stimulus value in order to tell whether it will be in its resting state or not. Likewise, if we happen to know the switch’s present status in a system, we may qualitatively determine the stimulating quantity by comparing the present status against the “normal” (resting) status. If a switch is in its resting state, then the stimulating quantity must be less than the trip threshold. If a switch is in its actuated (non-normal) state, then the stimulating quantity must be greater than the trip threshold. The next example showcases these determinations. We may determine a switch’s degree of stimulation by comparing its present status with its “normal” status. If a switch happens to be in the same state as its normal state (i.e. resting), we know its stimulus must be less than the threshold (trip) value.